The Essential Introduction to Traditional Thai Massage! Students will learn a classic Northern-style routine of 90-120 minutes, a flowing series of massage, acupressure, energy meridian therapy and "applied yoga" stretching that softens, loosens, unravels & lengthens the whole body! Principles of proper body mechanics are an important focus throughout the course, ensuring safety for both client and practitioner, while promoting efficient, effective technique. Students will also be introduced to related cultural aspects of Thai history, traditions and healing philosophy. This 40-hour course is the first required for the 75-Hour Basic Certification. Part Two is the 35-hour Body Mechanics & Refinement. 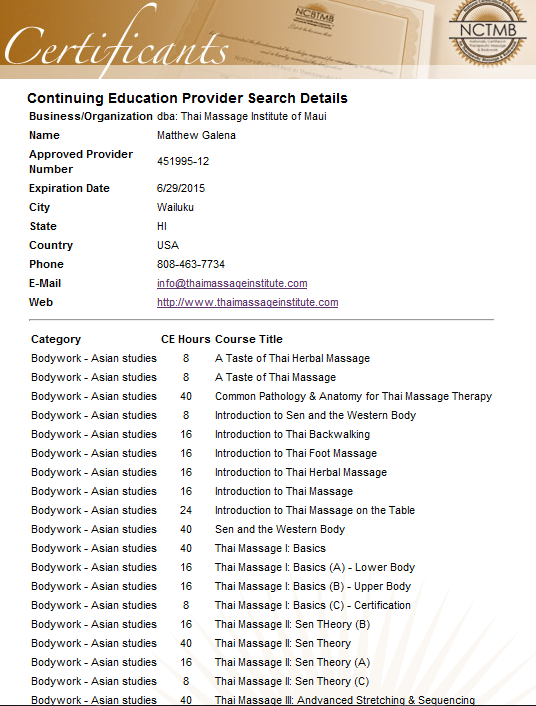 You may take these courses separately, or enroll in the 10-Day Intensive Basic Certification. 1-on-1 instruction and practice in a supportive environment. No experience in massage or yoga is required! Five days is the minimum time needed to learn and practice each element of this classic-style Northern routine! While students will be practicing and repeating what they've learned each day, note that on Day 4, you're still learning new material! Practice, Practice!! Students are guided through the entire flow with the instructor. Each person will give and receive two full-length massages! There is A LOT of information in this course that builds up fast. While you don't need to remember the complicated theory (because there is no test after only 5 days, and it is in your book for later reference), what students do need to focus on is the "keep it simple" details of each Thai pose, and the step-by-step choreography to get the essential form and flow! Days are 8 hours each, 9am - 6pm. Prices do not include HI Tax of 4.166%, or fee for credit cards of 3.99%.